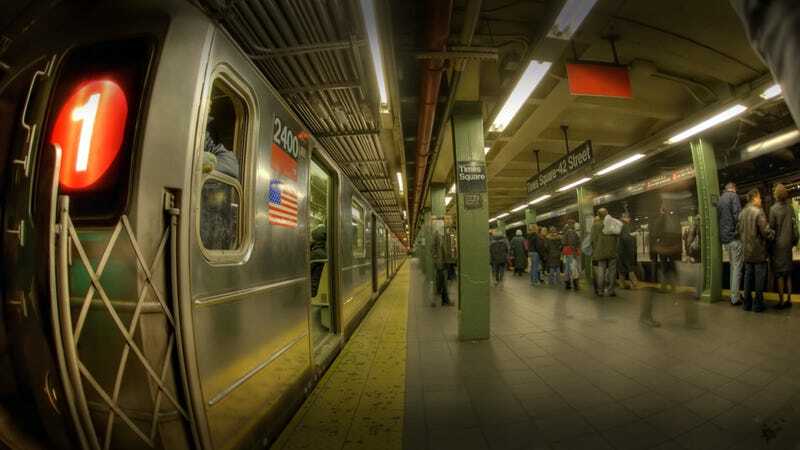 New York City's subway transports more than 1 billion passengers along 660 miles of track each year. Still, most of us know very little about the hundreds of blue-shirted men and women responsible for getting us to and from our destinations safely and efficiently every day. So what's it like to work the rails of one the largest underground transit systems in the world? We came across this revealing thread on Reddit created by a first-year MTA subway conductor anonymously answers some of our most burning questions about NYC's underground railway and the people who operate it. Here are 14 of the juiciest and gruesome things we didn't know about running a New York City subway train. This post was originally published by Dina Spector at Business Insider on October 20, 2011 at 9:09 AM. It has been republished with permission. "Sick passenger" is code for "dead customer ON the train"
Often times it actually IS a sick passenger though - sick usually refers to some kind of bodily injury, rather than someone puking or passing out, and the delays are mainly from the MTA doing an investigation to cover their butts when that customer eventually files a lawsuit. It happened 136 times in 2010 (statistic includes accidental deaths). So about twice a week. It hasn't happened on one of my trains yet, but I did witness it happen on a train right across from mine. Whenever I think something is about to happen, I close and lock my window. Not so much because of random crazy people, but pissed off customers who think I deliberately closed the train doors on them personally. So far I've been very lucky with the passengers who actually make it onto my train - I've had two people removed by police so far. Yes, it's very easy to forget which station is coming up next. I sometimes have to cheat and look at the wall signs while coming into the station, especially if it's after an express run. Train operators (the person up front) can zone out even easier, since they never get to see the station activity. I work in the IRT, which is the numbered lines (1,2,3,4,5,6,7). I've worked each of these lines multiple times. The BMT/IND (lettered lines) has a completely separate crewbase, since they use different equipment, so I never touch any of those lines. The system maintains two separate fleets of cars, one for the IRT lines and another for the BMT/IND lines. All BMT/IND equipment is about 10 feet (3.0 m) wide and either 60 feet 6 inches (18.44 m) or 75 feet (23 m) long whereas IRT equipment is approximately 8 feet 9 inches (2.67 m) wide and 51 feet 4 inches (15.65 m) long. Service will be disrupted for about a half hour, usually. I've seen it mess up things for as long as 3 hours though. One of the first things you do in conductor training is stand in one of those little clearance holes in the wall and let a train pass, and it's what really separates the men (and women) from the boys. There are some conductors who make $100,000+ a year. However, they are at top pay, work 6 days a week, 12 hours a day and have no life outside of work. The average senior conductor makes about $65K a year. Some parts of the 123 remake were incredibly accurate (the rail control center was an almost perfect replica of the real life one! ), while others were laughingly bad - train operators do NOT operate from the left side of the train....I can't believe they actually went out of their way to move the console to the other side. The best thing you can do is run as far down the platform as you can (in the opposite direction from where the train enters the station) and wave your arms frantically to get the train operator and passenger's attention. Believe me, the passengers WILL be doing the exact same thing, as nobody wants to see you get run over and their train get delayed. If you can get to the far end of the platform, it gives the train more room to stop, and there is a ladder at the end of each platform where you can climb back up - do NOT try to climb up from where you are. So many people have been killed trying to jump back up rather than getting away from the entrance end of the station. Do NOT trust the pits between the tracks - they are often right next to the third rail which can be just as dangerous (and note that the wooden planks are not designed to hold a human's weight - they are there to protect the energized rail from drips and weather) and the train operator is less likely to see you if you're in there. And don't duck under the train, because most stations do not have enough clearance for the average human. And do NOT jump down onto the tracks to try to save someone else. I met the train operator who got attacked by a knife-wielding maniac who actually jumped through the cab window from the platform and tried to get the train moving so that he could run away from his imaginary enemies. That occurrence takes the cake from most co-workers I've asked. There was also the train operator who saw a guy and a girl, both completely naked, both pointing a gun at his train from the platform. He floored it, "forget it, the customers can stand to miss one little station at 3am." Pension (25/55), 401K, Health-Vision-Dental-Prescription insurance, and almost foolproof job protection once you have at least 1 year in your title. Plus lots of job growth opportunities for those who want it (you can come in as a conductor, but go into an electrician apprenticeship, at full pay, for example). Longevity payments once you're here for 15 years, 2x holiday pay, up to 5 weeks of paid vacation a year, sick days, and your birthday off. The older trains can do 65, the newer trains 55. The fastest I've ever seen one of my trains do was 53 mph, in the 4 train tunnel under the East River. Between stations they usually run 20-30 mph. On good express runs (72 to 42 St on the 2/3 is one of the better ones), they can get above 40. All I ever see in the tunnels are rats and track workers. I've seen a couple of emergency exits converted into living rooms though, complete with real couches and beds.